Canadian Advanced ESP Inc. operates a 2,850 square feet Electrical Panel building facility in Edmonton. The facility was opened in 2012 for development, manufacturing and testing of control and automation equipment to support the Electrical Submersible Pump product line. We offer a turn-key solution to our clients, providing Electrical Engineering and design; wiring and assembly; programming and configuration; and testing and certification. While our focus is to build and supply standardized product for the oil and gas industry, we have also supplied electrical panels for other industries, including power distribution, mining and geothermal power production. We offer a wide range of Electrical Engineering services including project management, AutoCAD Electrical drafting services, programming, testing, equipment specification sourcing and all aspects of new product design. We pride ourselves in being able to provide solutions that are customized to our client’s needs. Our programmers are familiar with many different hardware platforms and software protocols. We specialize in in working with Mitsubishi, SCADAPack, Unitronics and Redlion. All our products are documented in detail so we can provide a complete package to our clients and maintain quality and consistency between builds. Our products are built to strict engineering standards and are CSA certified for use in Canada and USA. Each assembly is fully configured and put through its paces in our in-house test facility before delivery to our clients. We specialize in Electrical Submersible Pump (ESP) and Horizontal Pumping System (HPS) applications. Our engineers can assists with field commissioning of the controls and automation equipment and troubleshoot start-ups and shutdowns. Increasingly higher demands are being placed on efficient operations for economic benefit. This can only be achieved through constant monitoring of well parameters and continuous optimization of the ESP system. We supply the products, infrastructure and engineering support necessary to achieve this objective. Suitable for DOL (Direct on Line) starting, our low voltage switchboards are designed for use with a step-up transformer to achieve desired ESP load voltage. Standard sizes include Size 3 (90A), Size 4 (135A), Size 5 (270A) and Size 6 (540A) across voltage ratings ranging from 380V to 600V. Suitable for DOL (Direct on Line) starting, our medium voltage switchboards are designed for direct coupling to the ESP load. Standard sizes include 1500V (180A), 3300V (180A) and 5000V (400A). Suitable for variable speed applications, our ACT3 ESP VFD is designed to control, monitor and protect the ESP system, process discrete and analogue signals from external devices such as sensors and pressure switches, and provide connectivity to SCADA enabled devices for remote monitoring. Standard models are available in custom designed NEMA 3R outdoor enclosures to suit a wide range of power ratings. Similar to our ESP VFDs, our HPS VFDs are specifically designed for the extra IO and sophisticated control schemes associated with HPS applications. Standard models are available in custom designed NEMA 1 indoor enclosures to suit a wide range of power ratings. Designed specifically for our VFG product line, these panels control the frequency and voltage output of the generator. More information on the VFG product line can be found here. Many of our products incorporate a colour touchscreen for the operator interface. This enhances our VFD and VFG product line by providing access to more features and special functions that cannot be offered with a generic keypad interface. 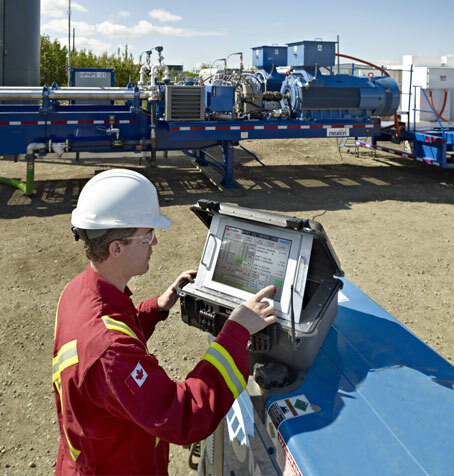 The AMT is our solution to internet accessible well monitoring. More information on the AMT product line can be found here. Where motor control and protection is required for fixed speed applications, we can provide the ACT Pulse motor controller. Those familiar with the Vortex and Keltronics motor controllers will appreciate the ACT Pulse as the most advanced ESP fixed speed motor controller available on the market today. We can also produce motor control centers (MCC panels) for motor bank applications. We can provide power distribution panels for multiple applications, including VFD and switchboard power distribution, motor bypass and isolation, and general power and lighting. Our engineers can design and build process control panels customized to your specific needs, including PLC panels, relay panels, instrumentation panels, RTU panels, operator consoles and SCADA communication panels. We design and build marshalling panels that provide the wiring interface and cross wiring functionality between control centers and field instrumentation. All of our products can be integrated into self-contained skid packages, ready to drop-in-place. Packages can be configured as skid-mounted, skid and frame, trailer mount or walk-in buildings. Do you have a project that requires a customized control panel? Do you need an engineered design with programming as well? Canadian Advanced can provide a turn-key solution that fits your specific needs.